This year's marching band consists of 267 outstanding members, comprised of 189 brass and woodwind players, 40 percussionists, 38 color guard, and 4 field commanders. This year’s band is under the direction of field commanders Kelsey Heacock, Shelby Brown, Isabel Calvert, and Brennan Colvard. This year's show is entitled "Picture-esque". The show opens with an exciting and aggressive mashup of two songs; Beethoven's Ode to Joy and John Adams' Short Ride in a Fast Machine. The second movement is a classic tune by Claude Debussy and will feature many different colors and textures, it is Prelude to the Afternoon of a Faun. The third movement will once again feature the percussion section while also showcasing the technical abilities of our students with Tschaikovsky's Dance of the Jesters...hold on to your seats for this one! The final movement of our show comes from an orchestral masterpiece by Modest Mussorgsky entitled Pictures at an Exhibition. We hope you enjoy this year’s contest show, Picture-esque. 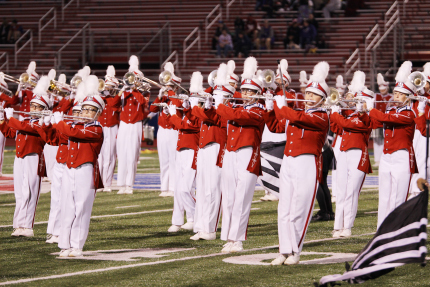 The Grove City High School Marching Band has won over 100 grand champion awards over the last twenty-five years in OMEA competitions as well as regional and national events. Accomplishments this past season include four OMEA Contest Grand Champions, straight superior ratings at OMEA State Marching Band Contest, straight superior ratings at District and State Concert Band Contests with all three concert bands, and many auxiliary awards during both the fall and winter season. Our distinguished band program has been seen across the state and nation with recent appearances including: The 2018 Ohio Music Education Association Professional Development Conference, The 128th Tournament of Roses Parade in 2017, The Magic Kingdom Electrical Parade in 2015, and another appearance this Spring as the band travels to the sunshine state to once again perform in The Magic Kingdom as part of the Festival Disney performance series. The concert band program consists of four ability based ensembles and music is selected based on each group; Blue Band, Crimson Band, Concert Band I, and Symphonic Band. 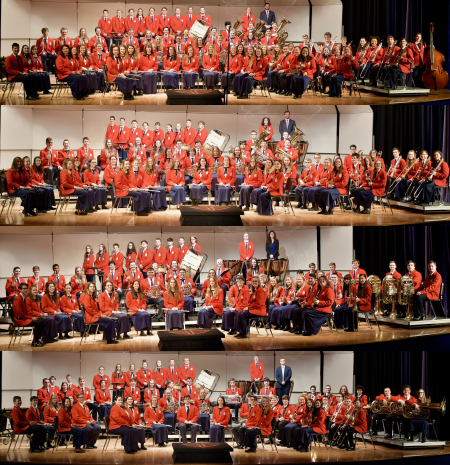 The Symphonic Band has consistently received superior ratings at OMEA State Concert Band Contest in Class AA since the inception of state contest in 1970 and the other bands have received superior ratings at all district events and superior or excellent ratings at state contest. Performed at the 50th Anniversary of the Mid-West International Band and Orchestra Clinic in Chicago, Illinois on December 19, 1996. Invited to perform at the Midwest Clinic again in 2002. Performed at the 1993, 2001, 2014, and 2018 OMEA State Convention and was the clinician band for the composer Francis McBeth at the 1995 OMEA State Convention, as well as for Mark Kelly in 1989. The Jazz Band was the Grand Champion Jazz Band of the Fiesta-Val International Band Contest held in Toronto, Canada in May 1995 and again in May 1996 in Williamsburg, Virginia. The band received Outstanding Jazz Band Awards in 1993, 1994 and 1997 at Music In the Parks competitions.